Two years ago, we launched an ambitious reimagining of Winrock’s approach to international development. The aim was to combine our organization’s long history of innovation and achievement with new strategies and approaches to position us for success in a rapidly evolving development environment. The past year has provided plenty of evidence that our efforts are both making a powerful impact in people’s lives and setting Winrock up to be even more effective in the future. At the core of Winrock’s new vision is a determination to deliver robust and verifiable results to the people we serve. One prime example of what that looks like in practice is the Pakistan Agriculture and Cold Chain Development project (PACCD), a joint effort between Winrock and the U.S. Department of Agriculture (USDA). PACCD was designed both to connect fishers and farmers with consumers eager to purchase their products and to introduce the infrastructure and technologies required to ensure goods didn’t spoil before arriving at market. The project, which ended in 2015, achieved those goals. By increasing yields and dramatically reducing post-harvest losses, the program helped boost farmer revenues by as much as 45 percent. In Cambodia, our years-long work as part of the U.S. Agency for International Development’s (USAID) Supporting Forests and Biodiversity Project helped lay the groundwork for the protection of 310,000 hectares of the Prey Lang Landscape, a magnificent swath of forest that has long been threatened by deforestation and poaching. Across the globe in Macedonia, Winrock staffers have worked closely with policymakers and the private sector to slash the amount of time it takes to invest in renewable energy projects by 12 months. 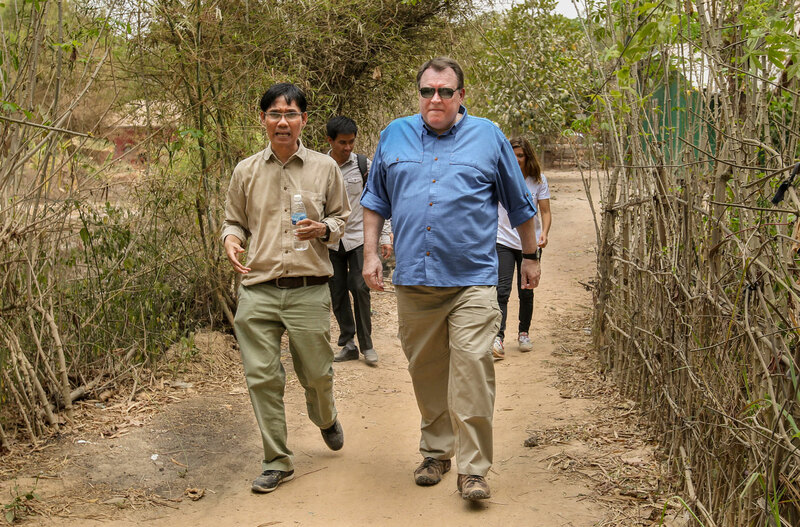 Ferguson on a recent trip to Cambodia. Photo by Mak Remissa. There are countless other examples of the impact Winrock is making with the 100-plus projects we operate in nearly 50 countries. But it’s important to remember that there are real people behind these statistics. In Nepal, for instance, Winrock runs the USAID-funded Knowledge-based Integrated Sustainable Agriculture and Vietnam Forests and Deltas. Nguyen Minh Du Nutrition (KISAN) project, which helps farmers select and effectively grow crops that the country’s consumers are eager to buy. Through the assistance he has received from KISAN, Kumar Thapa, a small farmer in western Nepal, now grows tomatoes, cucumbers and chilies instead of wheat and corn. The changes Thapa has made have literally transformed his life. Once compelled to leave Nepal to search for work in Qatar, Thapa has doubled his income and is able to send his two children to school, purchase more land and put away money in savings. Winrock is committed to continuing, deepening and expanding our global impact. To do that, we will remain focused on addressing the world’s biggest challenges. In 2015, for example, the decades of work Winrock’s American Carbon Registry (ACR) has devoted to developing carbon markets was incorporated into the United Nations’ successful Conference of the Parties (COP 21) climate deal in Paris. After the agreement was negotiated, Todd Stern, the U.S. Special Envoy for Climate Change, gave ACR credit for proving the viability of carbon markets: “You develop the methodologies that make it possible to do carbon market trading with environmental integrity, and that’s what it’s all about.” Winrock staff and volunteer experts also visited Cuba in early 2015 to explore ways to deepen our engagement with that nation’s agriculture sector. We expect to host a contingent of Cuban farmers in 2016, an example of both an evolving U.S.-Cuba relationship and the promise we see in expanding ties to benefit the people of both countries. To increase the impact of Winrock staff and programs, we will also continue to pursue important internal changes. Our legacy of innovation is a point of pride, and we will work hard to build on it by reinforcing a workplace culture free of silos, where ideas and people freely mix. Though the world’s challenges are more complex and interrelated than they’ve ever been, Winrock will always evolve and adapt to meet them. Two things won’t change. Our geographic reach will continue to include the United States, where we have an active and growing set of programs. What also won’t change is our core mission, which remains as relevant and important today as it was over three decades ago when Winrock was founded: to empower the disadvantaged, increase economic opportunity and sustain natural resources.